For answers to more why, what, where and how questions, click on the links below. Where is the deepest spot on Earth? When did the ancient Romans live in Britain? What is sand and does all sand look the same? Keep watching to find out about volcanoes too! How do birds find worms underground? The bird in this clip is a North American robin and looks a little different from robins in Europe. Why can't we live on the Moon? Which plants can eat insects? Did you know ancient Greek architects used three types of columns? 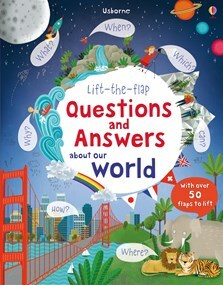 A beautifully illustrated, geography book full of flaps to lift to find answers questions such as “When can I see a shooting star?”, “Where is the tallest waterfall?”, and “What are clouds made of?”. Over 50 flaps to lift answer who, what, when, why and where questions about the weather and seasons, countries and languages around the world, what the Earth is made of and lots more. With a map of the world showing many of the features mentioned in the book. Katie Daynes has written oodles of books for Usborne, from lifting the flaps on germs and poo, through things to spot in the sea and at school, to the life stories of Nelson Mandela and Marie Antoinette. She wrote My First Chess Book after being taught by her son, Joe Birks, who became the British Under 9 Chess Champion in 2017. She now lives in Yorkshire with her architect husband, two inquisitive children and a hamster called Toffee. When she’s not writing books, Katie likes walking on the blustery moors, meeting friends for coffee and playing competitive board games. There is a contents page so you can go straight to areas of interest if you don’t want to read it in order. It's a book I will read again and again, and give it a big thumbs up.